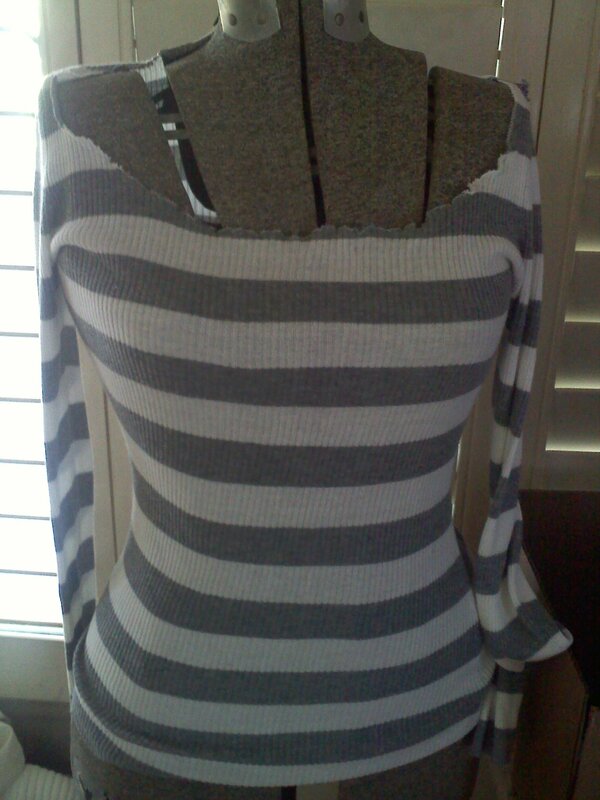 I’ve had this cute little gray and white striped turtleneck in my drawer for years. I rarely wore it but couldn’t toss it aside cuz I just loved how it fit and truly dug the stripes. Finally I realized that it was the turtleneck that was keeping this sweater in the drawer, so off came the turtleneck. Sorry, no before pics as I hadn’t planned on sharing this recon until later, but I’m sure you all can imagine the before pic – we’ve all seen too tight turtlenecks before, right? 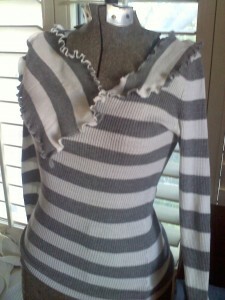 I wanted to make the neckline slightly off the shoulder but it didn’t quite work out that way. Instead what I ended up with was a squarish, way too deep neckline that didn’t work at all. Yucky squarish neckline not fit for human viewing. I put the sweater on my dress form and started playing with the turtleneck and the piece I’d cut from the neckline and this is what I ended up with. Playing with a deconstructed neckline. This was a pretty simple recon. I cut away the side hem on the turtleneck to make it one flat piece, then lettuce hemmed* all sides of both the turtleneck and the piece that I cut away from the neckline. 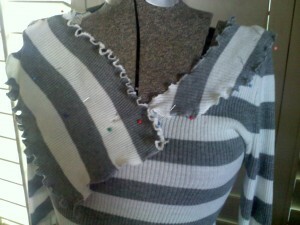 I pinned them to the sweater and hand stitched both pieces to the neckline so that the stitches wouldn’t show. That’s it! So happy to rescue this top from the bottom of the drawer and bring it to the front of my closet. In fact, I like this little refashion so much that I plan on doing several variations of it with some more turtlenecks. I’ll post them as I do them, but you all can get a head start by removing your own turtlenecks and playing around with them, which is what I’m going to do. Hint: if you don’t like the asymmetrical neckline shown here, you can cut the turtleneck piece to the same size as the piece cut away from the neckline. 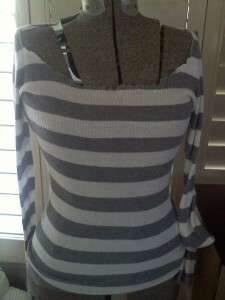 You can stop there or use the third piece along the back of the neckline to create more of a collar-like look. I’ll probably do something like that in one of my upcoming reconstructed turtleneck posts. I’m sure that there is a more professional way to do this but my 60 year old sewing machine only sews straight stitches and zig-zap stitches but I do like to make it sing. And no that’s not a play on words – it’s not a Singer machine. For this top I set the machine to a medium width zig-zag and the longest stitch possible. I used the inside edge of the presser foot as my guide so that the zig-zag was at the extreme edge of the fabric and I didn’t worry if occasionally a stitch or two went off the fabric. While stitching I allowed the feed guides to pull the fabric through while tugging gently on the fabric both to keep it lined up with the inside of the presser foot and to slightly stretch the fabric as it was zig-zagged. Try it on a piece of scrap knit fabric and you’ll be amazed at how easily you create a very pretty lettuce edge. While the idea for this top came from my own little brain, the inspiration and knowledge came from reading books like those from Amazon shown below. 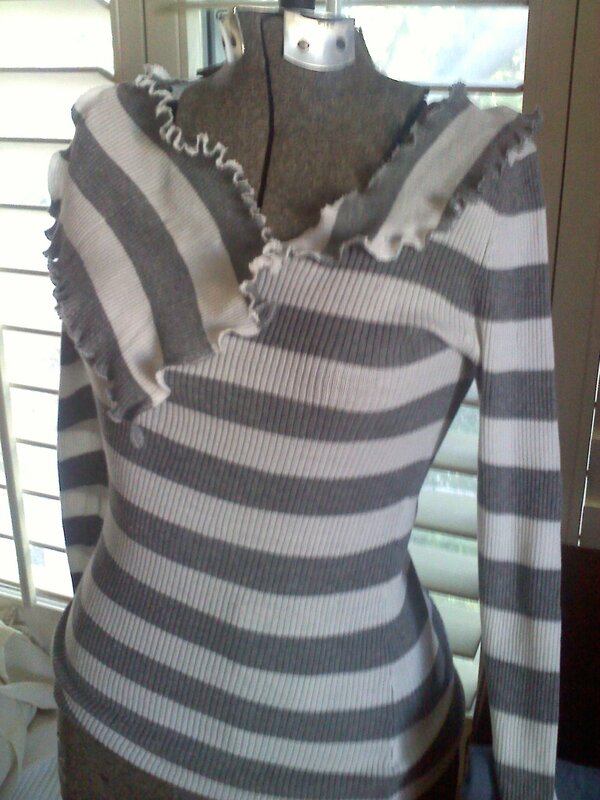 This entry was posted in clothing, Refashion and tagged deconstructed clothing, reconstructed clothing, refashion by Kat. Bookmark the permalink.